Will Kean Cipriano allow his daughter to enter showbiz? The 31-year-old singer-actor says he will always support whatever his daughter wants to become in the future. 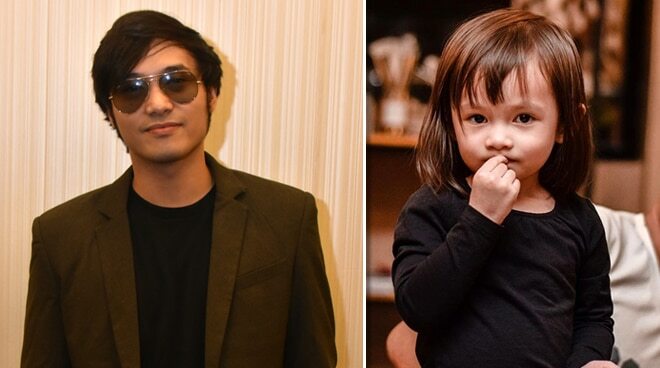 Kean Cipriano's fans think his daughter Stellar with wife Chynna Ortaleza has all the qualities of a future star. Stellar can sing, dance, and most of all, she is adorably cute. But will he allow his daughter to join showbiz? "Kung gusto niya. I mean ako naman, she will always be the compass. Kung ano'ng gusto niya, suportahan ko 'yan. Anak ko 'yan eh. I mean, why not," he said in an interview with PUSH during the ABS-CBN Trade Launch 2018. Right now, all Kean wants for his daughter is to enjoy, worry about nothing and have fun. "Gusto ko lang siyang mag-play school. Gusto ko lang siyang mag-enjoy na two years old siya, she's thinking about having fun and just playing. So play school muna siguro before all the workshops," he added. Even though Kean sees a lot of potentials in his daughter to join the industry he is currently a part of, he thinks it's too soon to decide whether or not he'll allow his daughter to join showbiz. "Mahilig siya kumanta, mahilig siya sumayaw. It's crazy when you see your child running around and nakikita mo 'yung sarili mo sa kanya somehow, 'di ba? But basta kung ano gusto ng anak ko, suporta ako sa ngayon. Kasi wala pa siyang mind to like really decide on something. Ako alalay lang ako," he stated. Kean Cipriano, who recently marked the 13th anniversary of his band Callalily, is also busy managing a label of his own called O/C Records which boasts of several up-and-coming artists including former IV Of Spades singer Unique Salonga. He will also be part of the upcoming ABS-CBN teleserye Playhouse which stars Angelica Panganiban, Zanjoe Marudo, Donny Pangilinan, Kisses Delavin, and many more.